The brain archaeal symbiosis due to global warming results in neanderthalisation of humans. The archaea induced uncoupling proteins producing the primitive Warburg phenotype and stem cell metabolonomics. The neurons become immature and lose their dendritic spines and connectivity. This results in loss of neuronal function and reversion to archaeal magnetite mediated extrasensory perception of low level of EMF. Exposure to low level of EMF results in brain changes. This results in prefrontal cortex atrophy. The primitive brain areas of cerebellum and brain stem become hypertrophic. The idea of goodness is based on reason and logic. Reason judgment and logic is a function of the cerebral cortex especially the prefrontal lobe. Goodness depending on cortical logic and reasoning is correlated with heaven. The idea of evil is based on the unconscious and the impulsive behavior related to subcortical areas especially the cerebellum. The cerebellum is the site of impulsive behavior and the unconscious behavior. The cerebellar and subcortical brain connections are predominantly archaeal colony networks. The idea of evil is related to hell. The idea of conscious judgmental acts and unconscious impulsive acts, heaven and hell, goodness and evil are juxtapositions. The conscious becomes minimal and unconscious brain takes over. 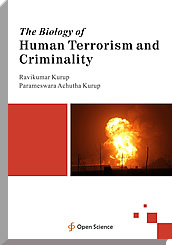 This produces the psychology of terrorism and criminality.